ELECTRO comes from the electro bio-energy content extracted from plants and the way that energy is extracted and made into remedies. 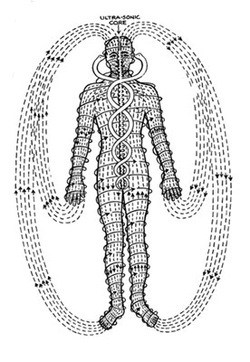 The force of electro bio-energy connects itself to any disturbance within the body and expels it from the system. It thereby restores the organic tissues and nervous system to their proper balanced state of health. And refers to the equilibrium or balance between the blood and lymphatic systems and works towards “Homoeostasis” which is the correct physical and chemical consistency of the body’s cells. This ensures that each and every cell interrelates as it should so that the body functions at its best. PATHY basically means a system of treatment. In short, Electro pathy is the system of natural medicines, made exclusively from plant extracts, by which a healthy balance is achieved and maintained throughout the whole body. The practice of Electropathy grew with the Italian Noble, Count Cesar Mattei who founded true Electro Homoeopathy in the latter part of the 19th century in Bologna, Italy. Being strongly influenced by the philosopher Paulo Costa, Count Mattei was motivated to devote his time and wealth to the service of humanity. He built on the works of Indian metallurgists and Ayurvedic /Siddha practitioners , also on Paracelsus and Balroot but he focused on preparing remedies extracted exclusively from plants. He called these remedies Electro Homoeopathic medicines. He called these remedies electro homoeopathic medicines on own his experiments of 30 years which show in his plants extract as vegetable electricity. Later on this system was further developed by Mattei adherent Theodore Krauss who have given the manufacturing method known as Krauss method (also mentioned in German Pharmacopoeia HAB) for making electro homeopathic remedies.This system became Electro complex homeopathy in his life time worldwide. After death of Count Mattei the progress and development was stopped during the First World War, during this period some so called perfectionists like Dr.A.Sauter in Geneva,Switzerland, and Father Augustus Muller in Mangalore, South India, took charge and established the so called true pharmacy of Electropathy , just as Minerva came out armed from the head of Jupiter( quote from Maria Venturoli Mattei). Electropathic Remedies —How Do They Work? Each remedy is derived from the active enzymes of several plants. When you take this complex remedy it completely covers and controls the body. It will then move through the body via the blood and lymphatic systems and target only those areas that require it. Once the diseased part is sufficiently saturated with the remedy, it stops absorbing it. When all the parts of the body have been healed and a healthy balance restored, the medicine itself is no longer absorbed. Therefore, there are absolutely no risks of over-dosing, side effects or drug dependency. Electropathic remedies purify the lymph and blood systems and can find and destroy the gravest of disorders. They can also help prevent disease by keeping the body pure and giving it a healthy balance. In sick person, the body fluids, lymph & blood become polluted and all the parts become abnormal state, which is why the disease develops in the body. Electro Homoeopathy is system of dynamic form of healing force extracted from the plants . It preserves and controls the organism Lymph and Blood, consisting of atoms, molecules, cell tissues, organs etc, by purifying them and returning them back to the normal state. The sick person recovers speedily and completely. Why was the name given Electropathy? The name Electropathy comes from the Electro content extracted from the plants, and the way this energy is extracted and made into the remedies. Electro Homoeopathy is a name given by the founder, on the basis that those remedies are class of energy conforming to the law of similar and they posses a power and promptness and speed of action of the remedy which allows them to be compared to electricity. Electro is not related to the electricity current and not using any type of electric machine in the treatments. Theodore Krauss was the disciple of Count Mattei. After death of Count Mattei the progress and development was stopped in First World War, so therefore Krauss took charge and established the pharmacy of Electro Homeopathy in Germany which is why this pathy also known as spagyric method of Krauss. Electropathic remedies work on the principle that diseased organisms are far more sensitive than healthy organisms and change the condition of the bodily fluids. A remedy should not be given to remove the symptoms of the body but to work on the cause of the disease. Electropathy is a system of medicine that draws all of its remedies from non-poisonous plants. It does not use sources from the mineral or animal kingdom. The remedies work with nature and help the healing force in the shape of Electro element. Who can use Electropathic remedies? Electropathy can be used by anyone of any age group who suffers from acute to chronic illnesses, for example, depression, arthritis, migraine, ulcers or ME. These remedies are all extracted from non-poisonous plants and do not create drug addiction or side effects. All remedies use the physical properties and not the chemical ones and are therefore ideal to combat the human body disorders without any side effects. How do Electropathic remedies work? The manner of preparing these compound remedies is the method of “cohobation”. This method uses plant extracts in the higher energies (vital force). This is a very potent invisible force, abstract in the natural form and transforms every constitution of the living being as an ‘Od Force’ (vital force). Each remedy is derived from the active enzymes of several plants. When the complex remedy is administered to the patient it completely covers and controls the body. The remedy will then move through the body acting on the parts that require it. As soon as the diseased part is sufficiently saturated with the remedy, it stops to absorb it. When all the parts of the body have been healed, the medicine itself is no longer absorbed. This will depend on the individual & their personal health fitness. The holistic approach to illness needs to be given time & many ailments will not disappear overnight. Therefore a course of treatments is recommended to get the best result. Electro Homoeopathy treatment is always based on the Law of Temperament. The patient may be lymphatic, sanguine, mixed ,bilious or of a nervous temperament. The person belonging to a specific temperament will show symptoms based on that constitution. In order to learn the constitution of the patient, a full background into their history any inherited family health matters is required. A remedy is then given accordingly. What to expect when, visiting a practitioner? The patient will be asked questions relating to their medical history and perhaps that of their immediate family. Lifestyle questions, such as stress levels, diet; exercise regimes, and sleep patterns will be asked to ensure that a holistic approach is taken. Their own expectations of the treatment and what they hope the therapy will achieve will also be discussed. It is necessary for the practitioner to know that the patient comes under which temperament then the treatment can be assessed. The disease or condition they are displaying will also indicate what medicines should be taken. The patient will need to take the medicines, which come in the form of pill and liquid. You will be asked to attend another consultation when your prescription may change.